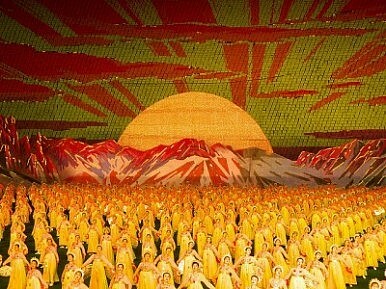 China will be keeping as close an eye as any country on North Korea following Kim Jong-il’s death. The death of North Korean leader Kim Jong-il means tense times for arguably the world’s strangest state and its neighbors. Asian stock markets fell today on news of Kim’s death, and Japan’s and South Korea’s leaders are said to be in meetings to plan for possible North Korean attacks – deemed possible during the transition period as successor Kim Jong-Un shores up his military credentials. The South Korean Yonhap news agency reports that North Korea tested a short-range missile on the day of Kim’s death, but it’s not clear that there was a connection. In the not unlikely event of a crisis on the Korean peninsula – nuclear, conventional military, or humanitarian – all eyes are likely to be on China, the isolated state’s international patron and nominal ideological ally. China is North Korea’s main supplier of energy and food aid, and has shown in the past that it is sometimes able to coax the country’s leaders into limited cooperation with the international community, such as participating in the Six-Party Talks over nuclear disarmament. I spoke to Mike Chinoy today, a former CNN correspondent in the region and the author of “Meltdown: The Inside Story of the North Korean Nuclear Crisis,” who says that China will be a force for the stability of the Kim dynasty. “The main thing is that the Chinese are totally committed to propping up North Korea – a big reason why I don’t think it will collapse any time soon,” he said. For China, the collapse of the regime could be a nightmare, unleashing an uncontrollable flow of refugees into China’s northeast, while unification with the democratic South could bring U.S. troops within spitting distance of the Chinese border. Worse still, a disorderly collapse could leave the country’s nuclear weapons unaccounted for. But China likely will be pushing for change – warily. China sees the aid-hungry state as a liability, and has indicated fairly clear preferences that it abandon its nuclear program and follow a Chinese-style path of reform and opening. But, as Peking University Professor Zhu Feng told our Lowy Interpreter series last month, China’s influence appears to be severely limited – describing the aid it currently provides North Korea as a “breathing tube,” he said that China can’t threaten to withdraw it without risking full-on collapse. Although vital to the Kim regime’s survival, Zhu said, both know that China cannot afford to use its stick – and North Korea has shown no interest in responding to the carrot of increased economic aid.